Demand for gold coins and 2009 Proof Sets is turning out to be exceptionally high this September, US Mint sales data reveals. For the third straight time, clad 2009 Proof Sets have outpaced their prior week sales. Collectors purchased another 42,077, which surpasses the previous weekly gains of 40.5K, 27.9K and then 18.4K. The reason for the surge? Perhaps the Fall US Mint coin catalog is reminding collectors to buy the popular annual offering. More than 1.1 million have sold. Bullion American Gold Eagle coins are flying high compared to the last two months. More than 30,000 were scooped up per week this month. The new total is 92,500. That is already higher than figures from August or July. Bullion Silver Eagles had their best week this month, surging 500,000. The month may turn out to be the slowest for the silver coins this year, but the 1.1 million already sold ranks it as the second best September ever (since ’86). Ultra High Relief Double Eagle Gold Coins have reached 94,464. Sales did retreat slightly. Next week’s numbers will show how the gold pieces performed with their limits removed. 2009 Lincoln Cent Proof Sets dropped less severely than the prior report. 8,115 were added, bringing the total to 120,957. Two-roll sets of Lincoln Professional Life pennies climbed by 7,603 to 221,718. The next round of excitement for the Lincoln pennies will be the 2009 US Mint Sets that go on sale Oct. 1, and the special Lincoln Coin & Chronicles Set scheduled for release sometime in Oct.
American Eagle Bullion Coin Sales: Sept. The US Mint sold 19,864,500 Silver Eagles and 931,000 Gold Eagles in 2009, as of Wednesday, Sept. 23. 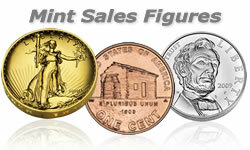 The non bullion coin sales figures above have an "as of date" of Sept. 20. The last reported sales figures are located at 2009 Proof Sets Shine, Presidential Dollar Sets Pass 600K.